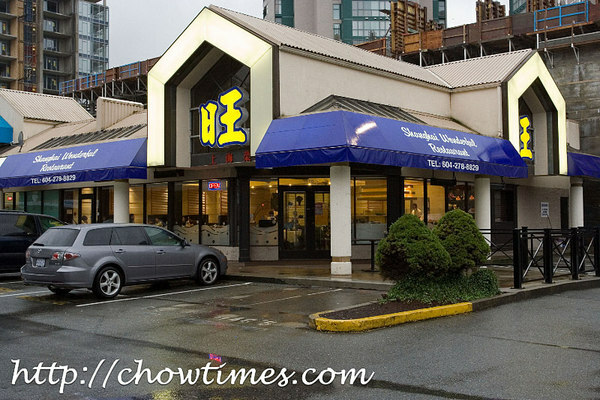 Hey … right off the bat … I am saying this … this is one Chinese restaurant that simply MUST check out. We had been passing by the Shanghai Wonder Restaurant many times before. Each time, we see that the waiting lines spill out of the restaurant. It was not until Craig blogged about this that we see what the fuss was. He liked it so much that he actually blogged about it TWICE! Knowing how busy this restaurant is, we decided to go extra early ahead of the dinner crowd — it was at about 5:30PM, I think. It was great because we had practically the whole place to ourselves, well, at least for 30 minutes. We got seated at the booth tables along the wall … which was great because those tables were on a raised platform. It give a better view of the entire restaurant … i.e. being able to have a clearer peek at the neighboring table’s dishes. 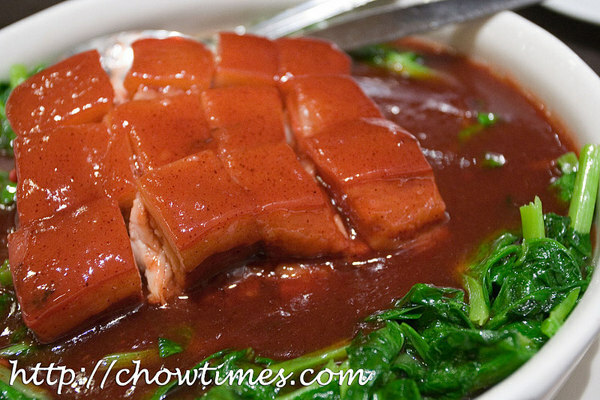 The first dish we ordered is the Cheery Pork with Brown Sauce on a bed of spinach. We find the name kind of odd. Cheery? Oh, I simply love this even though it is full of fats. The gravy/sauce too is simply marvelous. I think this is one of their signature dish. 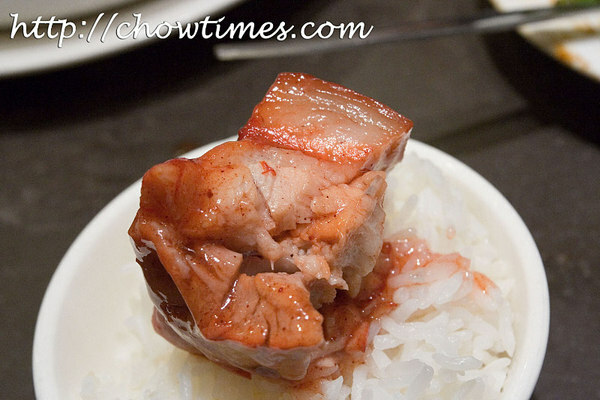 It came in a slab of pork neatly cut into cubes. This one costs $14.95. This is the cross section of the meat … it’s almost 1.5 inches thick with 1/3 of it fat. You will want the fat … that is what makes this great. You should try it. 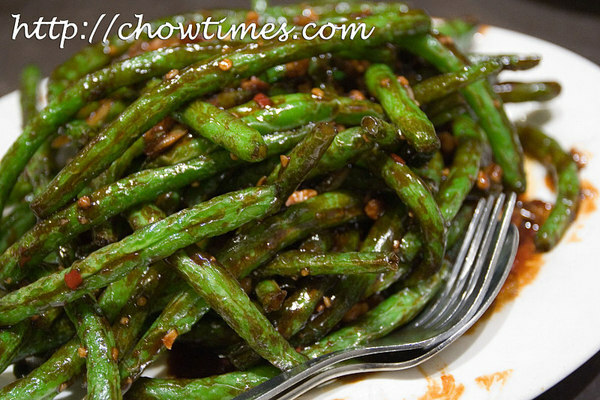 The Green Bean with Chili Sauce is less exciting. We just wanted to have a vegetable dish and had no idea what else to order. The green beans is fresh and that means that it’s crunchy. This costs $8.88 … lucky number. Oh, this one is unique … it’s called Crabmeat Tofu in Paper Pot. It’s served in the same type of portable stove that we had in S&W Pepper but with a twist … they serve the tofu on top of a paper lined top. Anyone know what’s the function of using paper? I guess perhaps it’s so that the tofu don’t get burnt … what do you think? 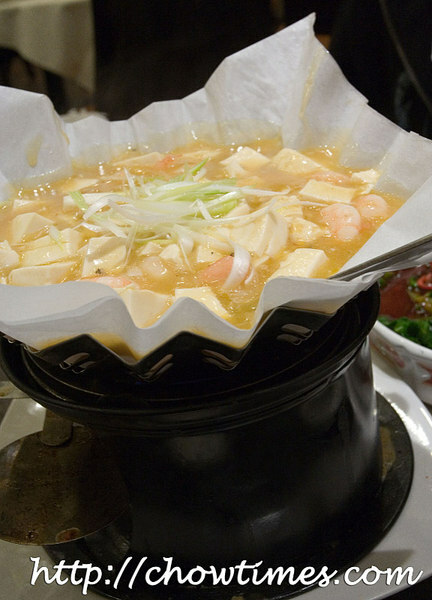 This Crabmeat Tofu in Paper Pot costs $14.95. Rice is ordered separate at $1 per bowl. So, the bill came up to about $50 including tax and tips. We will definitely come back again. 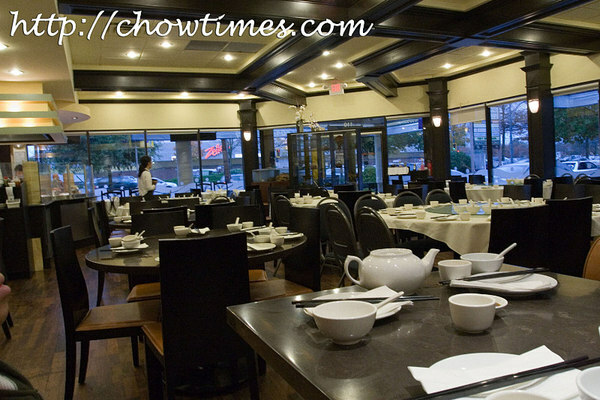 In his My Dinner Table blog, Craig blogged about their $188 set menu — that is for a table of ten. You know what I would like to do? I actually fancy organizing a dinner for readers of this blog to this restaurant to try their $188 set menu. Any takers? I am serious … I am thinking of a Saturday 5:30PM kind of arrangement. Send me an email at chowtimes@gmail.com if you are interested. It’ll be fun to meet new friends. Thanks Ben, great review! I also really like Shanghai Wonderful – I went back there today and took some photos. I agree, the pork is awesome!